People sometimes ask me how I start a painting. Starting a painting is easy. I just put down two strokes of color. The interaction between these two marks is the beginning of the dialogue that will develop within the painting. As more dabs of color are added, the painting takes shape and starts becoming what it wants to be. Some artists say working on a painting is like peeling the layers of an onion. I would tend to agree with that analogy. I try to listen carefully to what the painting wants to be. I paint quickly because, after all, the light is constantly changing. I tell the truth as I see it, leaving room for others to enter and have their own emotional response. 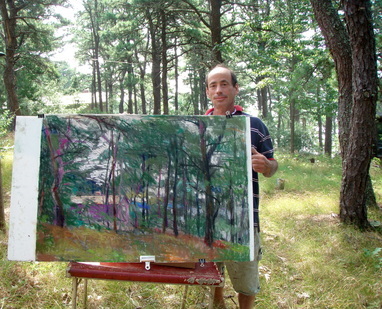 ​Larry Horowitz is an American landscape painter born in 1956 in New York City. Horowitz graduated from SUNY Purchase and immediately won the prestigious and coveted position as apprentice to Wolf Kahn. Larry Horowitz currently shows in galleries across the United States and in Canada. His work is in many major corporate and private collections. He has been selected to participate in the Arts-In-Embassies program in the United States Embassies in Finland and Russia. Horowitz's work captures the beauty of the American landscape with an expert use of texture and color that invites imagination and discovery. Through his art, Horowitz strives to depict America's vanishing landscape. 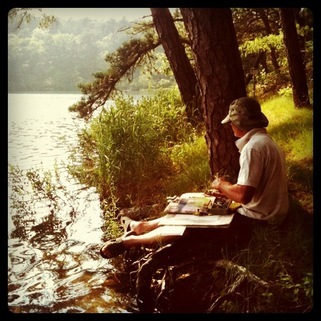 Although he paints en plein air, he has a firm grounding in abstract expressionism through his education with former students from the Bauhaus and Hans Hofmann school. He has combined both points of view to develop his own unique language.